Singaporean billionaire Peter Lim, the owner of Spanish club Valencia, has expanded into sports marketing by acquiring the image rights for football superstar Cristiano Ronaldo, it was announced Monday. Mint Media, a Hong Kong-based firm owned by Lim, said in a statement the six-year contract with Ronaldo would help grow the Portuguese icon's brand in Asia. Under the deal, Mint Media "will own and administer all of Ronaldo's image rights" except for those relating to his professional football club Real Madrid. Ronaldo, who has parlayed his popularity into lucrative brand endorsement deals, is ranked by Forbes Magazine as the world's third highest paid athlete in 2015 after boxers Floyd Mayweather of the United States and Filipino Manny Pacquiao. "Ronaldo is not just a great football player, he is also a very popular personality. I am confident that the Cristiano Ronaldo brand will continue grow," Lim said in the statement. 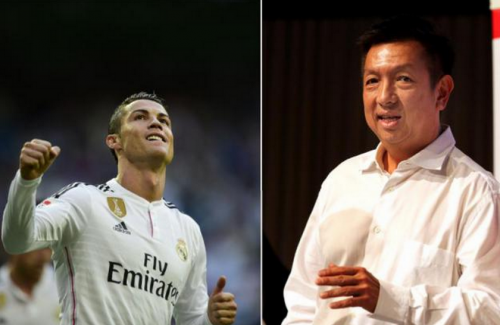 Ronaldo described Lim as "a good friend" and expressed admiration for his business acumen. "I believe he will be a good partner and good value add for my brand," added Ronaldo, a three-time winner of the FIFA World Player of the Year award. Ronaldo is heavily into social media with over 36 million followers on Twitter and 103 million fans on Facebook. Lim, a former stockbroker, last year bought a controlling stake in the financially stricken La Liga side Valencia. He is also a key investor in McLaren Automotive, a British manufacturer of high-performance cars. More marketing related jobs can be found right here!